The 1901 Hosmer House is home to the Faculty of Medicine’s School of Physical and Occupational Therapy, which offers undergraduate, graduate and professional programs. The house, made of conspicuous orange sandstone, shows the influence of the Paris Beaux Arts and has an ornate facade in a distinctly French style. 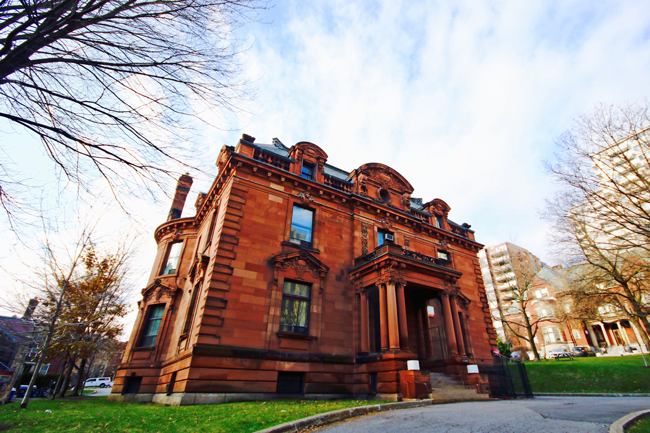 The 1901 Hosmer House is home to the Faculty of Medicine’s School of Physical and Occupational Therapy, which offers undergraduate, graduate and professional programs. The house, made of conspicuous orange sandstone, shows the influence of the Paris Beaux Arts and has an ornate façade in a distinctly French style.